Military Air Surveillance Squadron (EVA 13), Civil Guards Since Totana Main, Local Police Headquarters Totana, Civil Protection and civilian authorities have presided at the Plaza of the Constitution the institutional act of homage to the Spanish flag, for the fifth consecutive year, to mark the feast day of Pilar, Patroness of the Civil Guard, which also served to remind the deceased of the Local Police, Civil Guard and the Army. The event was held at the end of the traditional Mass of the patron saint of the Guardia Civil that has taken place in the Convent of the Three Hail Marys, which received assistance of a large audience thanks to the good weather of the day. Trained staff to honor the flag has been composed by members of the Guardia Civil station Totana and members of Totana Local Police and representatives of the two armies and the Municipal Corporation, who have completed training. Before the act has been read the article four of the Spanish Constitution which deals with the flag of Spain and the ensigns of the autonomous communities. Then two members of the local police have carried the flag discovered to the base of large pole located in this plaza, where a member of the Guardia Civil station Totana proceeded to its lifting while the musical group has interpreted Totana national anthem and all the training has been in uniform salute position. Then the act was performed in honor of deceased classmates Totana Local Police, Civil Guard and the Army, so that two members of the local police have carried the laurel crown officials have cast the foot of the temple of Santa Eulalia. 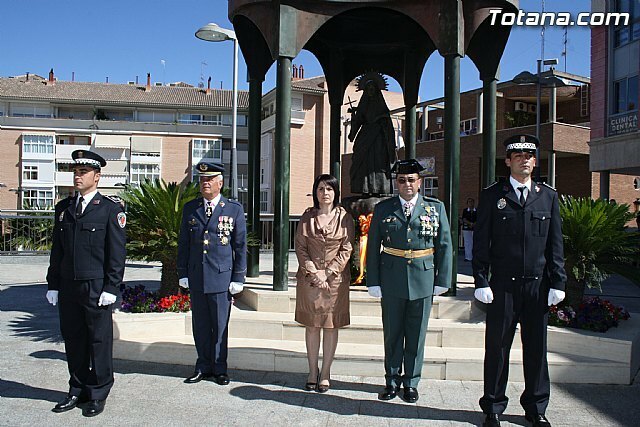 The Mayor of Totana, Isabel Maria Sanchez Ruiz, the chief commander of Air Surveillance Squadron No. 13 Air Force, José Vicente Royo, along with the lieutenant commander of the Civil Guard post Totana, Antonio Teruel Maya, have deposited the laurel wreath in honor of the deceased, while the band and the Coral Santiago have interpreted the song "Death is not the end."